South Africa is struggling with too many animals and too little open land. In Central and East Africa, poachers are killing tens of thousands of elephants a year, threatening the very survival of the species. In South Africa, however, conservationists are facing a different problem. In many of the country’s reserves rising elephant numbers pose such a threat to habitat and other species that radical solutions to population control — including vasectomies of wild bulls and chemical contraception of females — are being adopted. South Africa’s estimated 17,000 elephants live in fenced reserves with negligible ivory poaching, few predators, and abundant water. Natural mortality rates are suppressed, birth rates are high, and numbers have grown at around 7 percent annually, a rate that left unchecked means local populations can double in size in less than a decade. Now, landscapes are beginning to show signs of strain due to this population growth. Elephants are what biologists call “habitat engineers.” That is, they play a significant role in maintaining healthy, diverse ecosystems. But with a daily intake of 600 pounds of food and a habit of stripping bark from trees, pushing over large trees, and breaking branches to get at leaves, the beneficial effects of opening up dense bush can soon turn to habitat degradation when elephant numbers rise too far and too fast. Woodland is reduced to grassland, key tree species are lost (along with the unique ecosystems they support), and vulnerable species are out-competed for water. Where once elephants would have roamed widely for food and water, spreading their impact (and their ecosystem benefits) widely, fences now prevent such migrations. 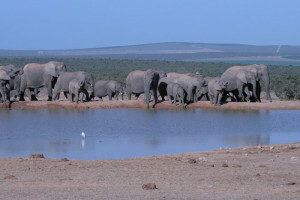 The construction of artificial waterholes, intended to improve game viewing for tourists, has compounded the problem. Such uncertainty hasn’t stopped wildlife agencies and preserves from seeking to control rising elephant numbers. The issue was thrown into sharp focus when authorities in Kruger, South Africa’s premier national park, raised the prospect of culling to tackle the reserve’s growing elephant population. Culling in the name of conservation isn’t a new concept. From 1966 to 1994 more than 16,000 elephants were culled in Kruger to maintain the population at around 7,500. The practice was suspended in 1995 in the face of intense international pressure. 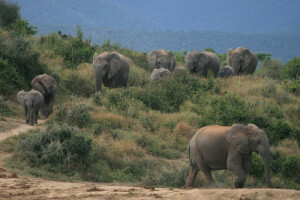 Since then elephant numbers have grown at around 6.5 percent annually, reaching around 16,900 at the last count in 2012. In 2002, Kruger’s eastern fence with Mozambique was removed and a transfrontier preserve — the Great Limpopo Transfrontier Park — was created. Some hoped that habitat pressure would be reduced through the merging of two existing reserves, but those hopes proved shortlived. Elephants are creatures of habit — they prefer to stick to established home ranges — and colonization of the Mozambique sector of the park proved a slow process. When 25 elephants were translocated to the new area, they turned right round and walked back home. Translocation to other reserves in Southern Africa is also not a viable option. Wildlife managers can’t give elephants away; existing reserves have all the elephants they can accomodate. Faced with an international and domestic outcry, park authorities shelved the idea of a resumption of culling and adopted a different approach — habitat and water management. Sam Ferreira, Kruger’s large mammal ecologist, explains that around half of Kruger’s artificial boreholes have been closed down, forcing elephants to travel longer distances to find water, increasing mortality during droughts, and lowering the birth rate. It’s part of an evolution from the outdated “command and control” strategy of maintaining a “natural balance,” to a more dynamic systems-based approach that seeks to restore natural processes. 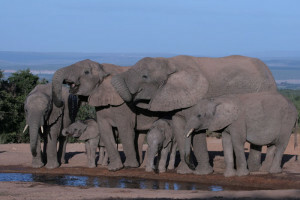 So far, it’s proving successful: the Kruger elephants’ population growth rate has dropped to just 2 percent. Kruger’s vast size (about 7,500 square miles) has enabled such techniques to work. But across South Africa there are some 7,000 elephants in much smaller reserves, places where manipulating water supplies to force elephant movements isn’t an option. For many of these reserves, contraception has become the population control tool of choice. Adult females are vaccinated with porcine zona pellucida, or PZP, an immuno-contraceptive made from the ovaries of pigs and administered by dart. According to Humane Society International field director Audrey Delsink, who has been instrumental in developing the technique, more than 500 female elephants in 20 protected areas are now being treated, with the number likely to exceed 1,000 within the next year. 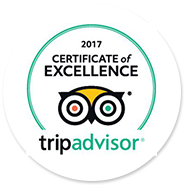 In the last year alone, PZP has been adopted by three major provincial parks — Ithala, Mkhuze and Hluhluwe-iMfolozi — and one national park, Addo. Birth control for female elephants may seem radical, but it’s nothing compared to performing vasectomies on bulls. That’s the solution pioneered by not-for-profit NGO the Elephant Population Management Program (EPMP). The procedure involves setting up a complete mobile operating theatre in the middle of the bush. Since elephants’ testes are inside their body, complex and invasive surgery is required. The darted elephant is maneuvered to an operating table while suspended from a huge crane. Vets use specially developed, extra-long fibre-optic laparoscopes, cutting through two inches of skin, four inches of fat and 10 inches of muscle on their oversized patients to reach the vas deferens, from which a section is removed. The prohibitively high cost of this sterilization procedure remains a concern. “The real use of this procedure will be applicable to smaller fenced populations where only two to ten bulls are present,” says South African National Parks chief vet Dr Markus Hofmeyr. But is elephant birth control really the solution? Or, more to the point, is too many elephants really a problem? He believes parks like Kruger should not be considered in isolation, and he envisions a series of mega-parks stretching across Africa, with corridors allowing elephants to migrate freely, alleviating seasonal pressure on local vegetation. He points to the example of northern Kenya, where a series of corridors linking the reserves of the Samburu-Laikipia complex have enabled elephants to expand their ranges. It’s an attractive idea, but 5 million people live in the vicinity of Kruger — and people and elephants make uncomfortable neighbors. It’s unlikely that the fences will be torn down any time soon.